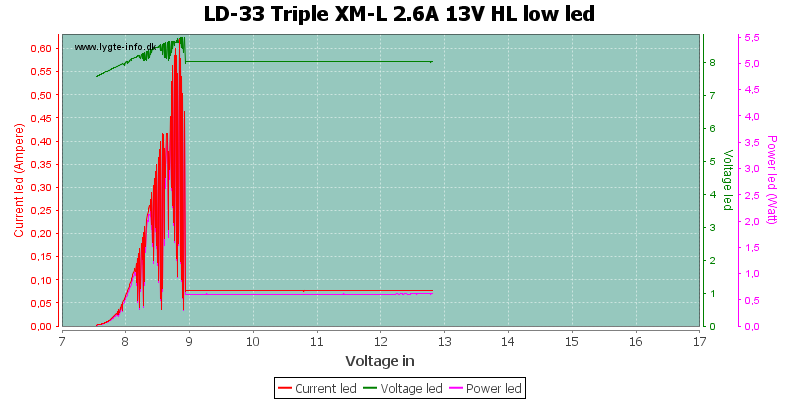 Tested with: 3 Cree XM-L2 in series. 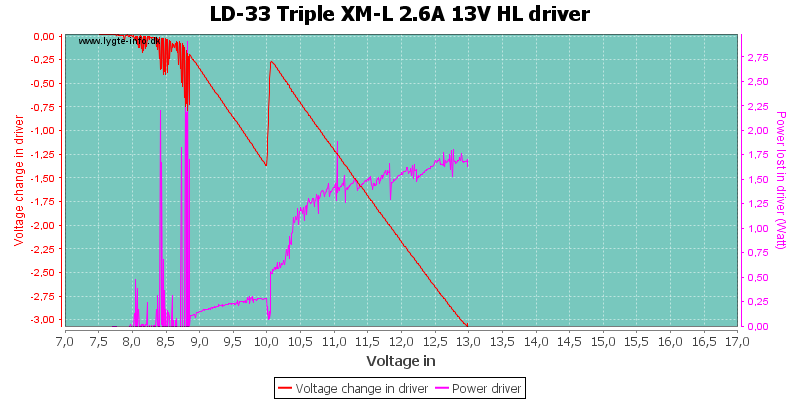 With four batteries the driver keeps full output down to about 14.5 volt, then the output drops and at 11.7 volt the low battery warning starts. 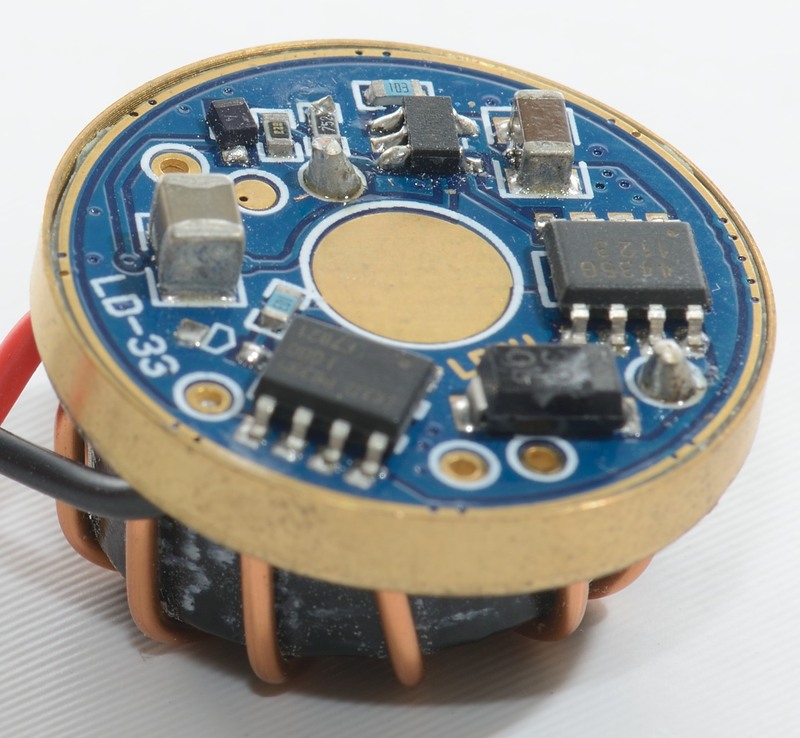 The low battery warning will drain the batteries down to 7.5 volt, before it turns off. 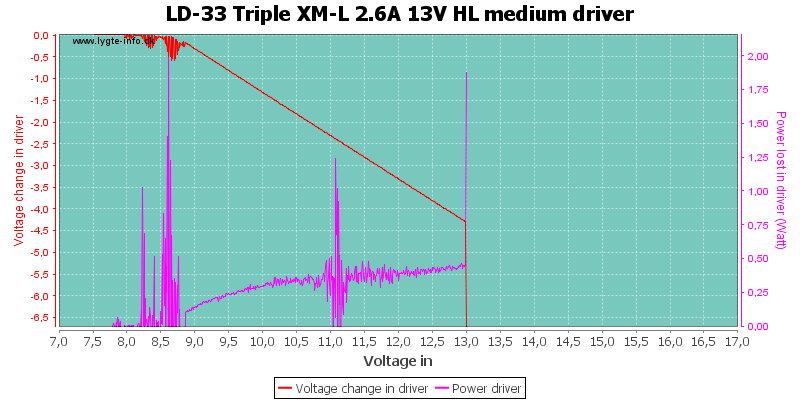 With 3 batteries, the driver will first drop in power at 10V and start warning flashing at 9 volt. As with 4 batteries the low battery warning will drain the batteries down to 7.5 volt, before it turns off. There is a slight difference in the buck frequency, depending on number of batteries. 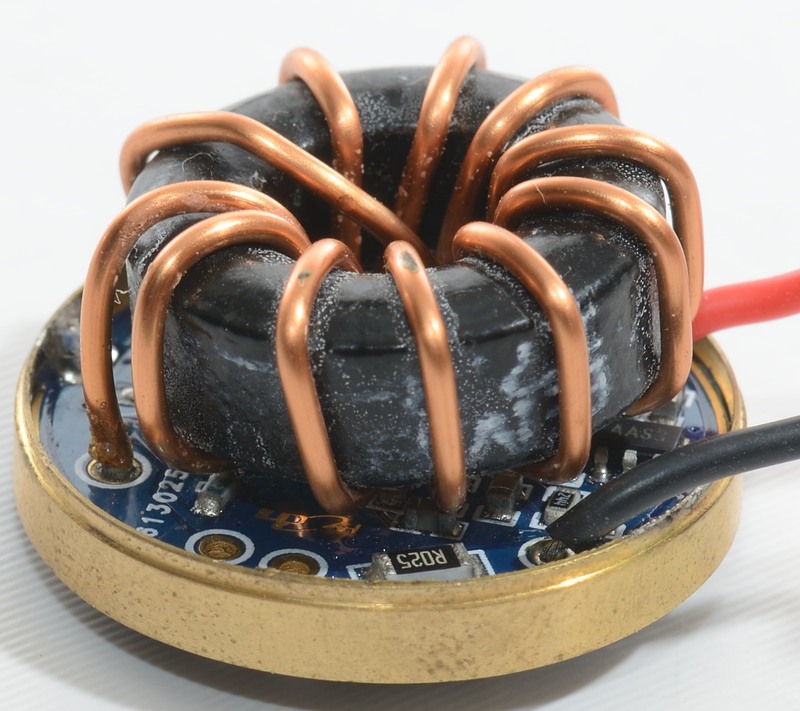 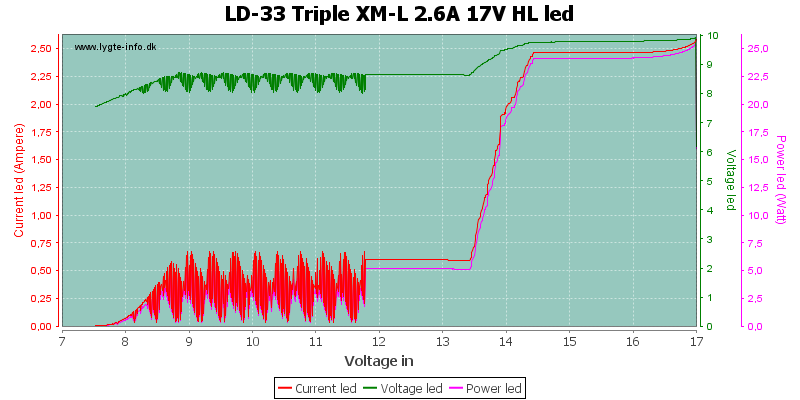 The low voltage warning is not a fast flashing, but a slow (2 sec cycle time) ramping up and down. 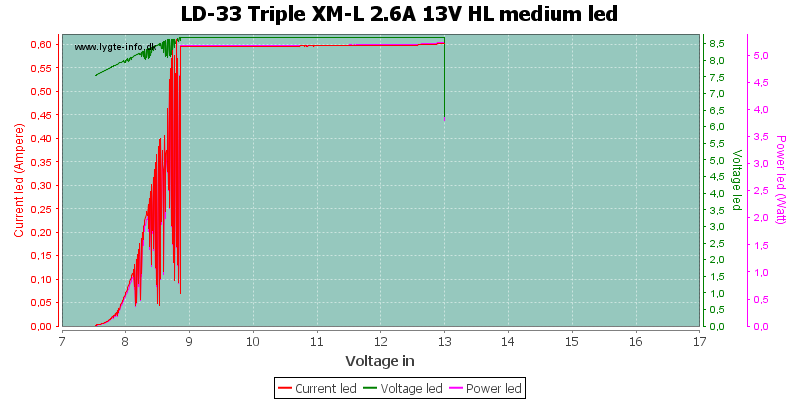 On medium the light does not step down, but goes directly to warning flashes. 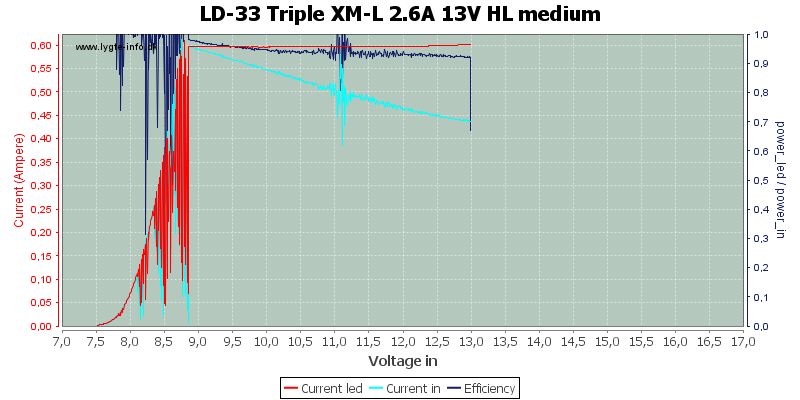 This works the same way with 3 batteries. 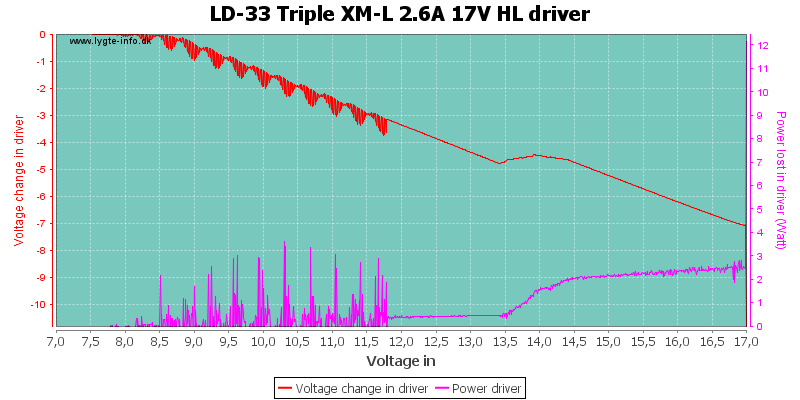 In low mode the efficiency goes down, due to the drivers own power consuption. 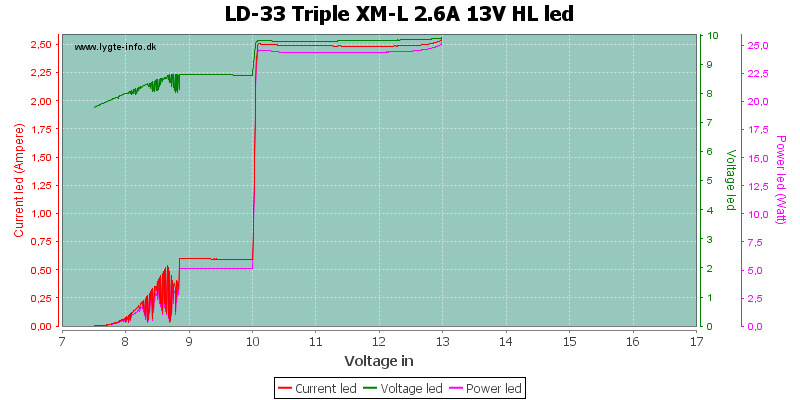 Also note that warning flashes increases the current consumption. 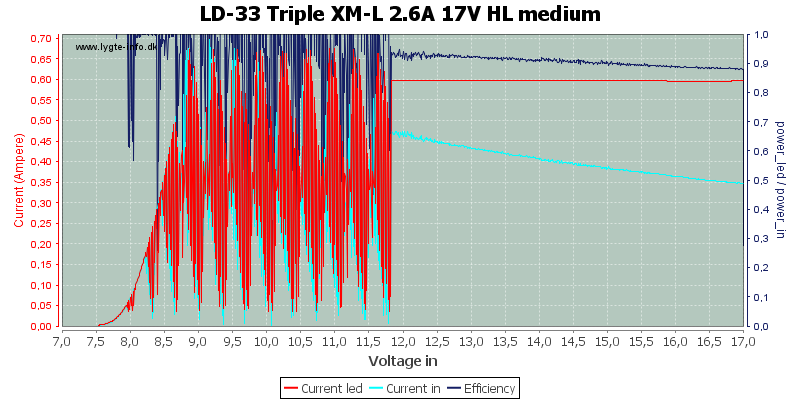 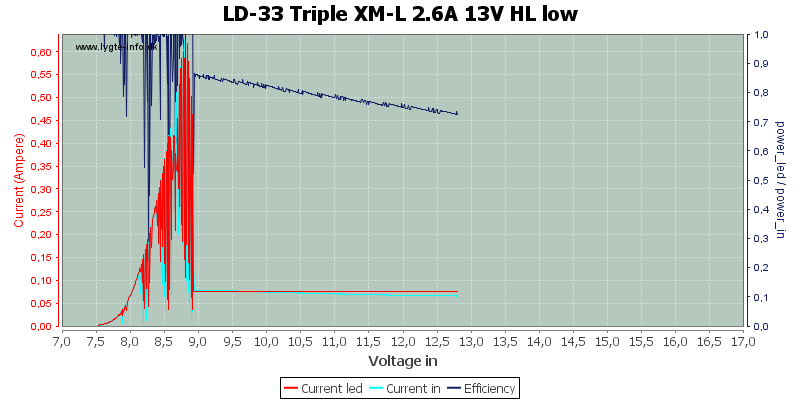 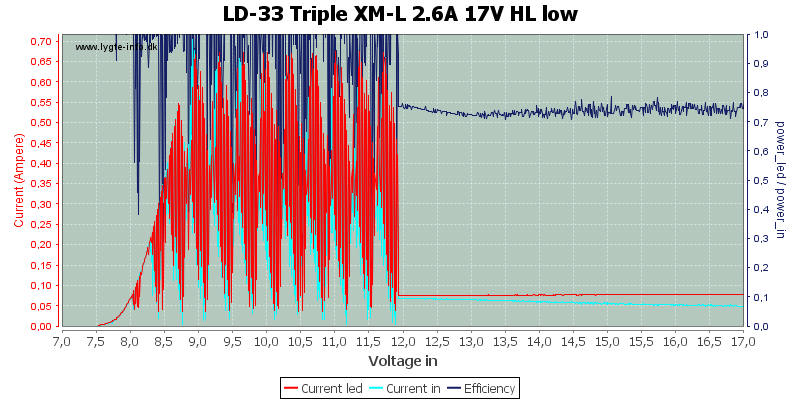 In low mode the 3 battery curve does not start at 13V, but at 12.8V. 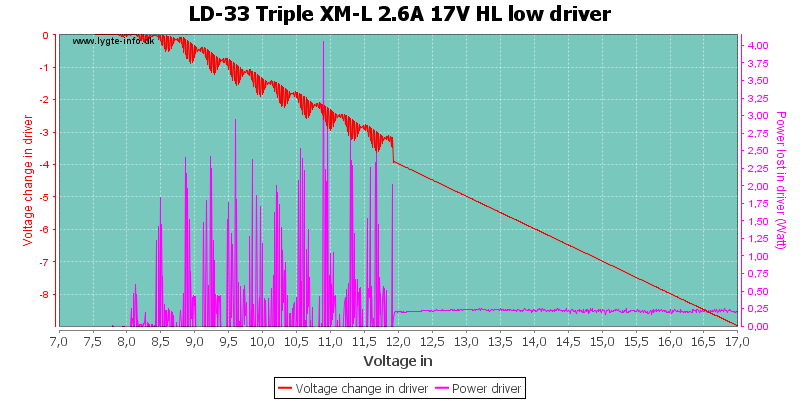 There is a reason for this, the 3/4 battery threshold is just below 12V in low mode. 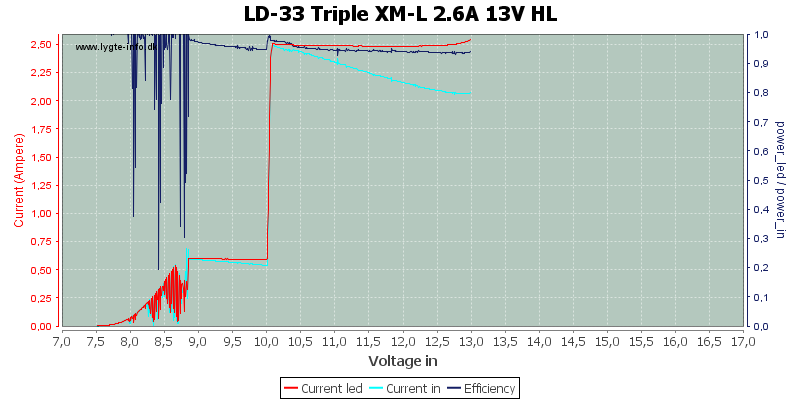 With strobe the lower battery voltage has largest output. 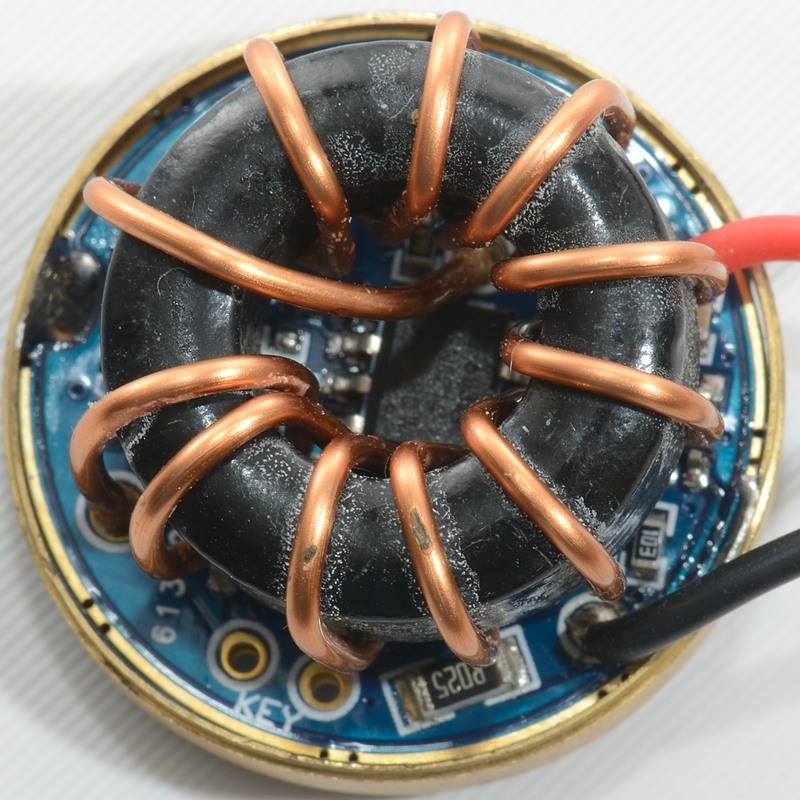 The strobe frequency is 15 Hz. 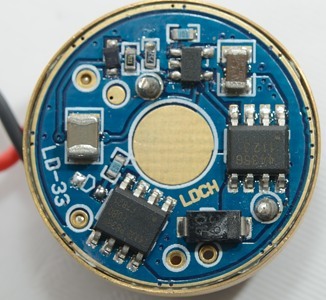 The sos mode is nearly unaffected by the battery voltage. 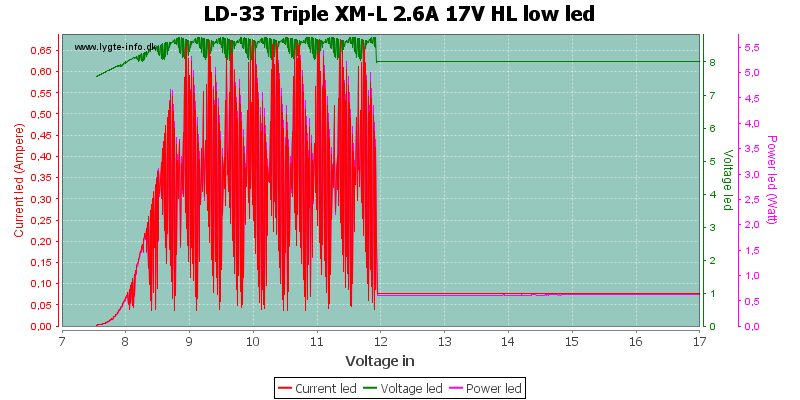 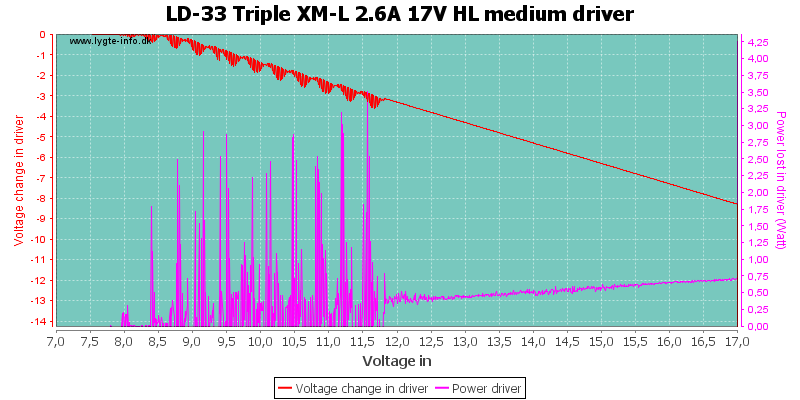 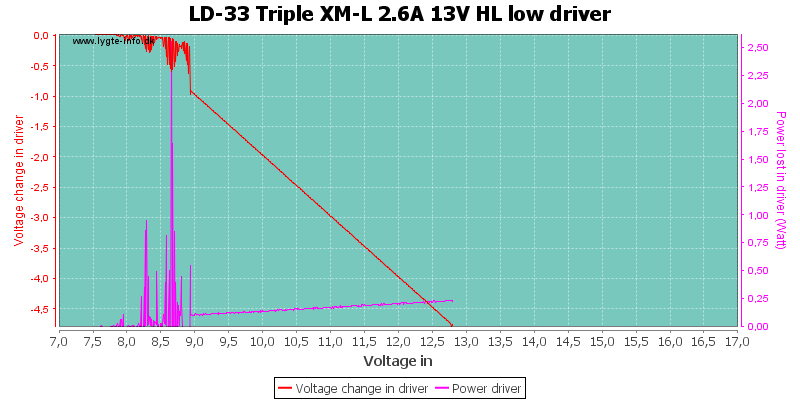 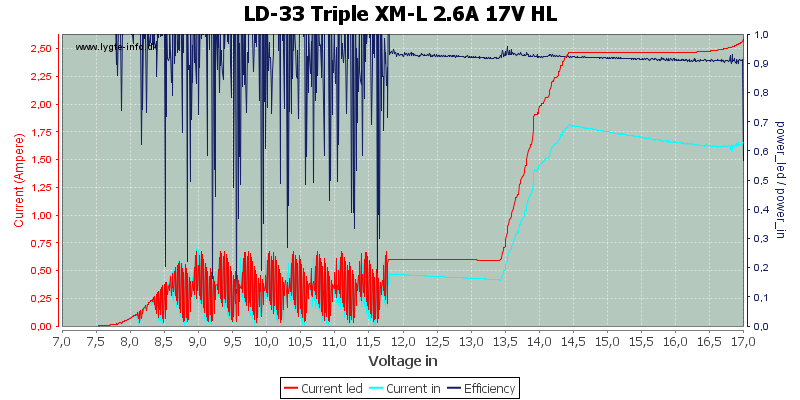 This driver does a good job of driving 3 leds from 3 or 4 LiIon batteries with good efficiency, but I am not impressed with the low voltage warning, it activates at to low a voltage and it does not shut down the light. 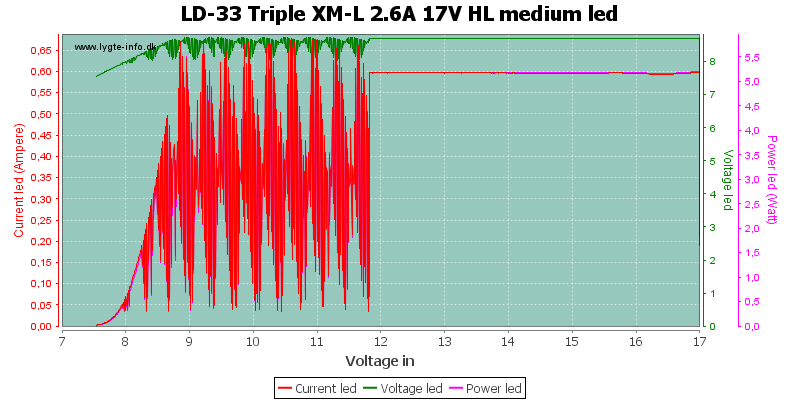 This means it is important to use protected batteries (Always a good idea with batteries in series).